The objectives of the study, which covered each of the US states, were to map the current market landscape of medical grade oxygen for use in CH and to develop a cost simulator based on a patient’s needs and geography. Results from our study showed that the current costs for oxygen use as an acute therapy in CH are not prohibitively expensive for patients and healthcare insurance providers. Apart from CMS, many insurers do reimburse the cost of oxygen use for CH. Our study suggests that further research is needed to determine if a lack of physician awareness about treatments and ways to prescribe are barriers for patients to access the high-flow oxygen treatment. 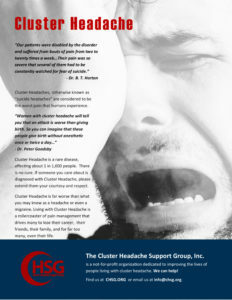 The Clusterbusters Medication Use Survey characterized the use and efficacy of inhaled oxygen in cluster headache patients in order to identify the various factors that optimize therapy. Fifty-seven CH patients according to ICHD-II-criteria participated in a single-blinded, semi-randomized, placebo-controlled, crossover inpatient study, and 102 CH attacks were treated with 100% oxygen delivered by demand valve oxygen (DVO), O2ptimask or simple mask (15 liters/min) or placebo delivered by DVO for 15 minutes. Primary endpoint: Two-point decrease of pain on a five-point rating scale within 15 minutes. Oxygen (O2) is life essential but as a drug has a maximum positive biological benefit and accompanying toxicity effects. Oxygen is therapeutic for treatment of hypoxemia and hypoxia associated with many pathological processes. Pathophysiological processes are associated with increased levels of hyperoxia-induced reactive O2 species (ROS) which may readily react with surrounding biological tissues, damaging lipids, proteins, and nucleic acids. Protective antioxidant defenses can become overwhelmed with ROS leading to oxidative stress. Several small clinic and community-based investigations have indicated that more than 50% of CH patients have never used oxygen for the treatment of their headaches. This statistic is alarming and the reasons why they have not tried oxygen have not been determined. A double-blind, randomized, placebo-controlled crossover trial of 109 adults (aged 18-70 years) with cluster headache as defined by the International Headache Society. Patients treated 4 headache episodes with high-flow inhaled oxygen or placebo, alternately. Patients were randomized to the order in which they received the active treatment or placebo. Patients were recruited and followed up between 2002 and 2007 at the National Hospital for Neurology and Neurosurgery, London, England. Cluster Headache is a stereo typical primary headache syndrome characterized by attacks of unilateral excruciating pain usually in the eye, periorbital region, and temple with associated cranial autonomic symptoms such as conjunctival injection, lacrimation, nasal blockage, rhinorrhea, ptosis, and eyelid edema. During attacks patients are often restless, agitated, or both. Attacks typically last for 15 to 180 minutes untreated and have a frequency of 1 every other day for up to 8 attacks a day. Trigeminal autonomic cephalalgias, including cluster headache, are characterized by unilateral head pain in association with ipsilateral cranial autonomic features. They are believed to involve activation of the trigeminovascular system and the parasympathetic outflow to the cranial vasculature from the superior salivatory nucleus (SuS) projections through the sphenopalatine ganglion, via the greater petrosal nerve of the VIIth (facial) cranial nerve. Cluster headache is remarkably responsive to treatment with oxygen, and yet our understanding of its mode of action is unknown.